I’m guessing some of you are Harry Potter fans. And I’m guessing some of you know about J.K. Rowling’s new venture with the franchise, Pottermore. For those of you who don’t know, I’ll recap briefly. Pottermore is an online game/social network that guides you through the books with deeper information about each chapter and character. Along the way, you’re asked questions that allow a magic wand to choose you, and you’re sorted into one of the four houses at Hogwarts. There, you’re able to compete with other students in other houses in potion-making and wizard duels. 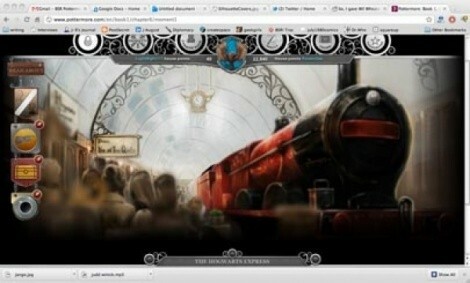 The Website, Pottermore.com, doesn’t open to the public officially until October. Fewer than 100,000 people in the world have access to it at this point, and I happen to be one of them. I’ve been exploring the Beta version of the Website for the past couple of weeks now, and want to share some of my experience with you. I’ll say right off the bat that I’m not the biggest Harry Potter fan. I’ve read each of the books just once, and aside from the third film in the series—a masterpiece, thanks to the deft direction of Alfonso Cuarón—I’ve only seen each of the films once. I think Pottermore might be perfect for a first-time reader of the series, however. You’re guided chapter by chapter—with gorgeous, interactive illustrations—through the story, and are able to read volumes of fascinating back story that is in the head of Rowling, but not on the page. I can only imagine that this would melt the brain of any serious Harry Potter fan. I know that if they put something like this together for the Star Wars universe, where I could travel scene by scene through all six movies and read a mountain of supplementary material, you might never see me again. As a writer and as a reader, I found the material we’re offered utterly captivating—from biographies of side characters barely glimpsed in the books to major events you might have imagined a hundred times but never really thought about. In one of my favorite examples, Rowling relates a story not seen in the books where Lily, Harry’s mother, brings James Potter home to meet their soon-to-be brother-in-law, Vernon Dursley. If you’ve seen the movies or read the books, you know how explosive that meeting might be, and Rowling delivers. It adds a depth I never would’ve imagined to the character relationships I already know so well. Re-reading the book is now an all-new experience. This whole Pottermore enterprise is, of course, part of Rowling’s larger digital marketing strategy. They’ll slowly be releasing behind-the-scenes material for new books over the months and years, as well as eBook versions of the original Harry Potter novels. Right now, only Harry Potter and the Sorcerer’s Stone is available to explore, and that might be the biggest problem. The “dueling as a wizard” section has been down since the third day, and making potions can be tedious (though my 8-year-old daughter is obsessed with it, even though she manages to melt her cauldron every time). Once you’ve thoroughly explored the book, there’s little left to do. Once the full public version opens and they’ve worked all the kinks out, I’m going to end up spending a lot of time on this site—and my guess is, you are, too.